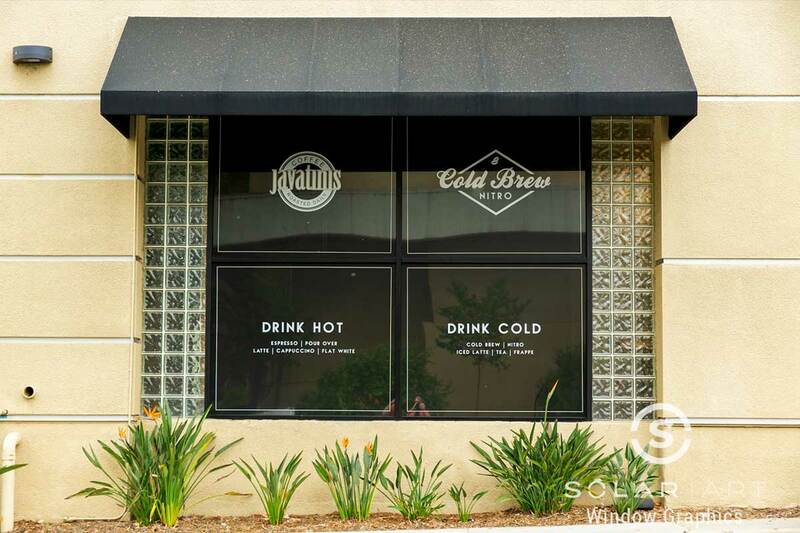 Solar Art was lucky enough to install both solar film and custom graphics to a local coffee shop in Laguna Hills, California! The customer was having a huge problem with heat and glare in his store. Customers were complaining about the terrible afternoon heat and glare on their laptops if they were at the coffee shop working.They also had old, outdated and faded advertisement window graphics on their windows. They are located on a main street and wanted to promote their business to potential customers driving by. They worked with Solar Art for their coffee shop decor needs. We installed Llumar DR 15 on windows throughout their coffee shop. Llumar DR 15 is a dual reflective window film that will greatly reduce glare. It is also a heat blocking window film and can reduce up to 75% of heat as well as 99% of UVA and UVB rays. According to Dave, the owner of Javatinis, “before the window film, it never got below 78°F. With the AC on, but now it can easily get to 72°F.” Dave and the Javatini’s crew worked with our in-house graphics team to create custom graphics to put on the windows facing the street promoting the shop and increasing traffic. They also had a wall mural installed in the shop for a decorative focal wall. After the installation was over a customer actually came into the store and told Dave he was in town on business and chose this coffee shop because of the window graphics he saw while driving by. Needless to say, the customer was really happy with the coffee shop decor results. An added bonus is both solar film and custom graphics can easily be removed if needed. 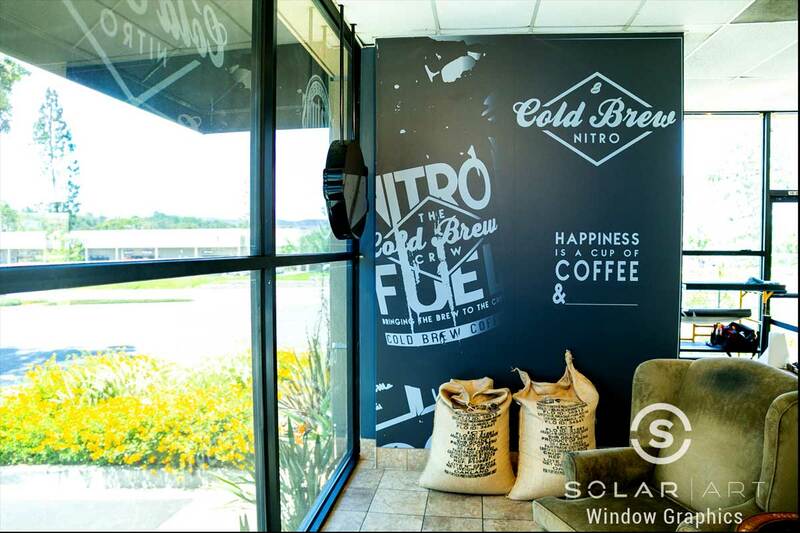 In addition to solar film and custom graphics, Solar Art also services graffiti window film, security window film, decorative window film and exterior building wraps to both residential and commercial settings. Interested in Coffee Shop Decor? Contact us directly to talk about it! Solar film can reduce heat and reduce glare as well as block 99% of UVA and UVB rays! Custom graphics are a simple and cost effective way to increase productivity and get potential customers!